A $750 T-bred, off the track for just four years, has qualified to compete at the preeminent Rolex Kentucky Three Day. AP Prime, grandson of the great A.P. 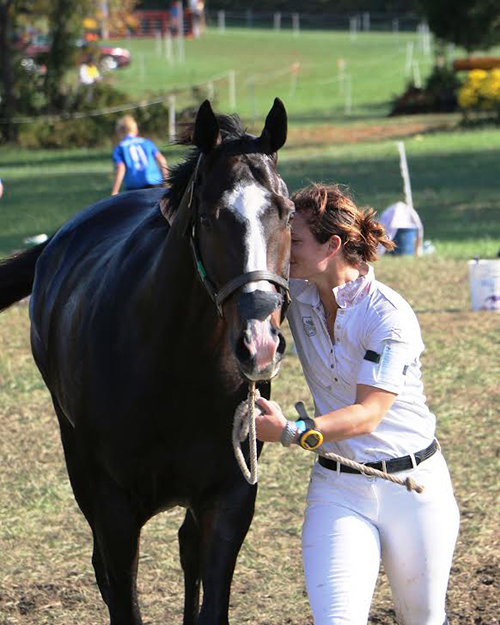 Indy, and his owner/rider Leah Lang-Gluscic rode their hearts out at Fair Hill last, despite being halted twice on course while injured riders were tended to. It was amazing to Lang-Gluscic that he was able to pull himself up from a hell bent dash over the challenging course, that twice had fallen riders ahead of them and caused the event to be momentarily halted. What a test! 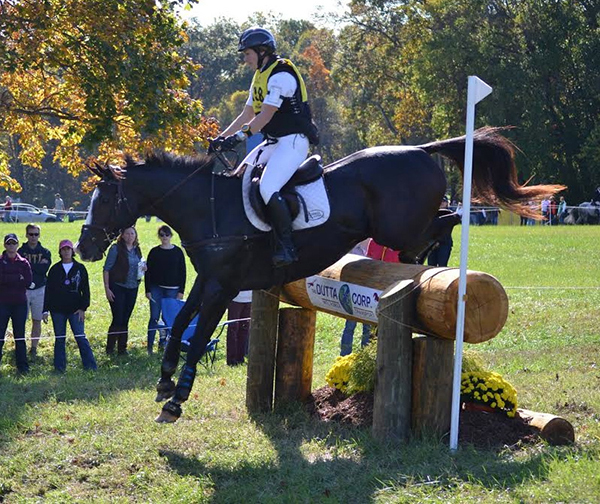 AP Prime and Leah Lang-Gluscic finish the cross-country course at Fair Hill after being halted twice for fallen riders. “AP was so professional! This was our first hold on course ever. It happened right after Fence 8, but I wasn’t worried, because the next fence was a big and inviting, and easy to re-start the course with,” she says. It got worse. “Then, after we got through with Jumps 9 and 10, we came flying up a huge hill and saw the huge blue tarps ahead, surrounding Fence 11." “When you see the blue tarps, that means something horrible has happened,” she says of the time-honored way of shielding the public’s view. Her heart hammering as she fought to rein in her ex-racehorse, and Lang-Gluscic was “very upset” until she was reassured that the fallen horse/rider team were not badly injured. And she kept AP walking and calm until she was given her third “Go!” signal of the day. The Fair Hill course wound up testing everything they had. About the author: Susan Salk is the creator of Off-Track Thoroughbreds, a blog dedicated to telling Success Stories of off-track Thoroughbreds who transition into next careers, or retirement. Please consider visiting the blog’s new store, Off-Track Products. Proceeds will help sustain this blog in the future, and go to charity.